The pool, with its elegant décor and exquisite surroundings, is the meeting point for all hotel guests. Its depth increases gradually to suit all ages. 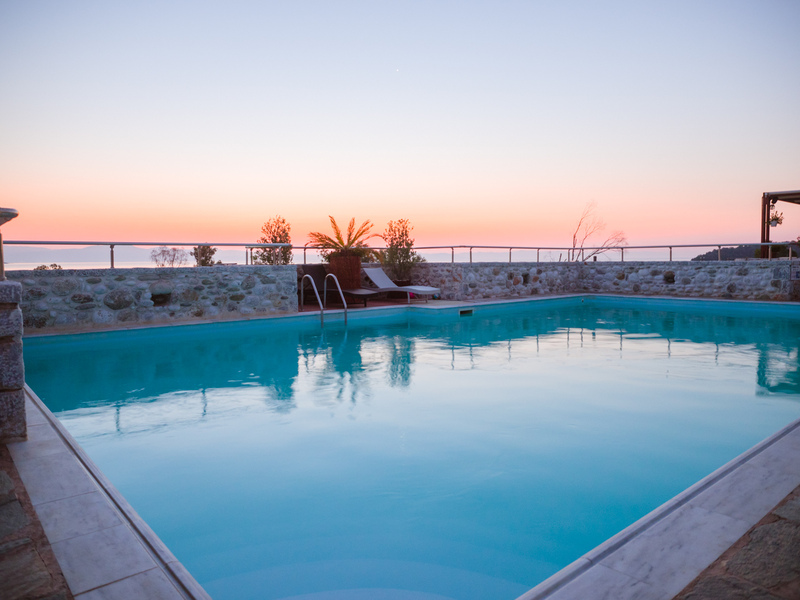 The pool tempts you to swim or simply enjoy the sun as early in the morning as you wish and till sunset. All of our attentive facilities are checked and cleaned every day, according to the prescribed rules of hygiene, and promise to you and your children moments of carefree fun and games. This unique setting –completed with our comfortable loungers- promises relaxation throughout the day for all hotel guests. At the same time, it is an ideal refuge, where you can enjoy refreshments or drinks in the evening. The view really captures the eye, as it wanders on the rich mountain flora and the sea, where the boundaries are lost and the blue of the sky and the sea blends magically.